8,000+ people, 22 locations, 7 time zones, 1 Cisco Leader Day. Cisco recently used Walls.io to centre their social media efforts for one of their biggest global leadership events. Cisco first used Walls.io for their Leader Day event in September 2017. 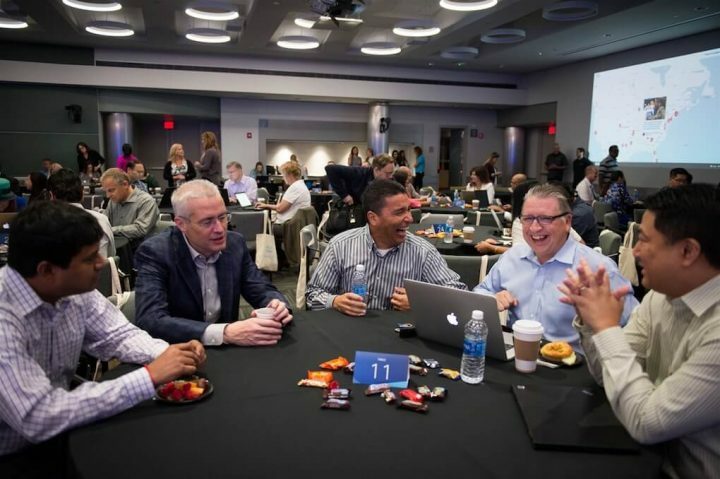 Cisco Leader Day is an all-day leadership event. It connects more than 8,000 leaders in the company so they can get on the same page about leadership. People joined Cisco Leader Day either from one of Cisco’s campus locations or from wherever they were working that day. The tricky part was that Cisco’s locations and employees are spread out over multiple time zones. Cisco used the company’s own technology Cisco TV to connect leaders around the world in a follow-the-sun approach. Furthermore, each time zone produced a hand-off video featuring an interview with a Cisco exec to get the next time zone started. The Wall and leaders in San Jose, California. 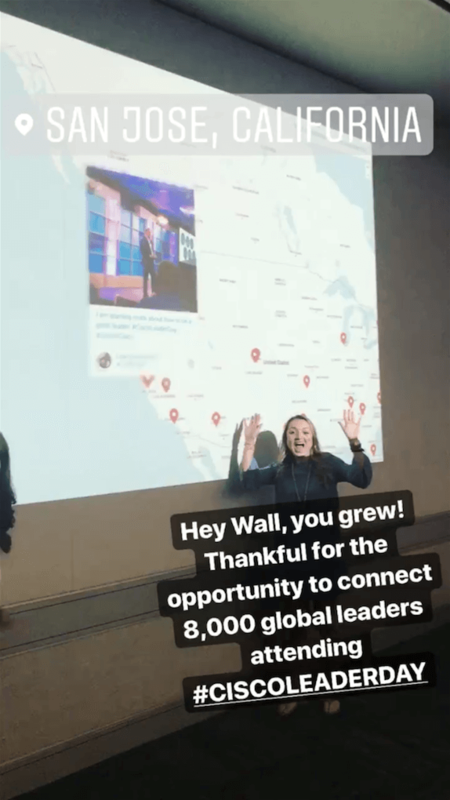 Cisco then augmented the global experience with Walls.io, connecting everyone with the #CiscoLeaderDay social media wall. One of their walls collected all social media posts with the hashtag, while a second wall displayed only the hand-off video. Chosen “social media ambassadors” made sure each time zone knew about the social walls and the hashtag. Cisco enjoyed the element the wall added to the event so much that it decided to keep using Walls.io for their monthly employee meeting Cisco Beat. Cisco Beat connects more than 70,000 people worldwide. The #CiscoBeat social map on Walls.io. how they are planning to use Walls.io in the future. Could you tell us about the events you are using Walls.io for? 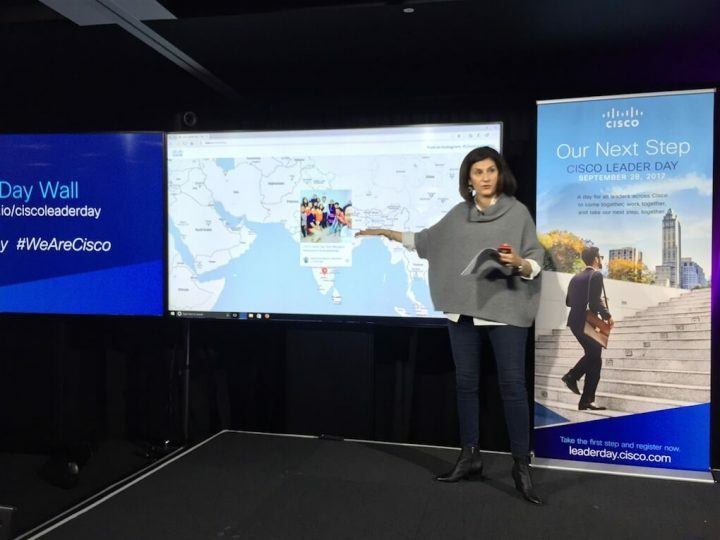 The first event we used Walls.io for was the Cisco Leader Day 2017, a first-ever global event that every leader participated in. We used a follow-the-sun model so that every leader could hear the same message no matter where they are in the world. Walls.io is now our go-to method for our events that take place on a global scale, specifically Cisco Beat. Cisco Beat is a monthly all-employee (around 70,000 people) call. Employees either watch the broadcast live on Cisco TV or they tune into the recording at a later time. The October event was the first Cisco Beat to feature a social media wall. 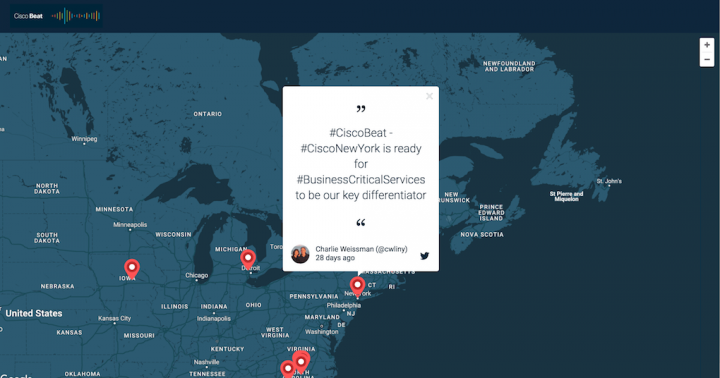 Employees shared selfies, excitement, and favourite moments on social media using #CiscoBeat. What is your main goal when using hashtags and social media walls? We started with an end goal of connecting sites, which sounds simple but is much more complex at this global scale. We wanted attendees to be able to see what other attendees were doing and saying about the same event they were attending. But given that people attended Leader Day in their own local time zone, a live connection wasn’t feasible. Liz Morgan posing with the Walls.io social map for #CiscoLeaderDay in San Jose, California. Having a specific hashtag and social media wall that pulled posts with that specific hashtag allowed posts to “sit” in one place for an extended period of time. At the end of the day, we had a “leader day story” that captured the entire leader day experience on a global scale. How are you motivating people to use the hashtags? We motivated people to use the hashtags by including a link to the wall and the hashtag in pre-event communication. At the beginning of the day, a prerecorded hand-off video from the previous zone was displayed for the next time zone. The leader opening up the day introduced the social wall and explained that posts with #CiscoLeaderDay would show up on the wall. 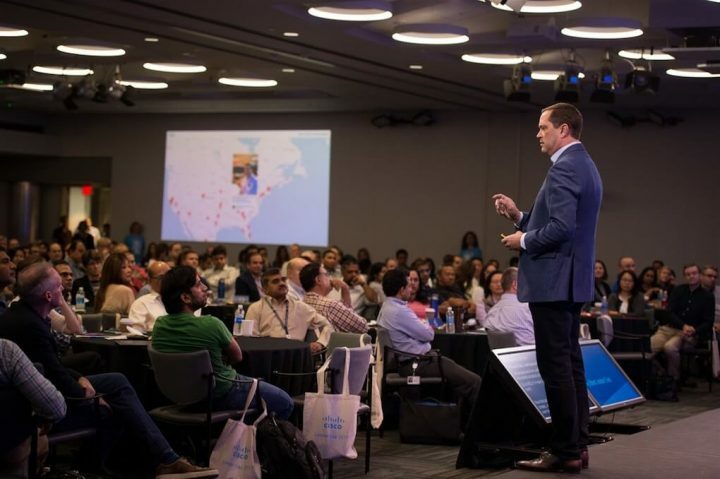 Cisco CEO Chuck Robbins in San Jose California during Cisco Leader Day. In addition, the wall’s feature that said “post on Twitter/Instagram using #ciscoleaderday” encouraged people to post. We also set up social media ambassadors in each major broadcast location to lead the way in case attendees weren’t posting as much as we hoped. They also recorded the hand-off videos, which we then posted on the second wall. Their posts served as an example of what we were going for, however, participants were extremely active on social media and posted on their own — it was INCREDIBLE! How are you using the Walls.io Map theme? The map theme is incredible for global events, and I’m so thankful that Walls.io rolled out this feature before Cisco Leader Day. It was TRULY amazing. The map highlights that the event is global — which, of course, everyone knows at the beginning of the day, but having something that shows where people are is amazing. Cisco Chief People Officer Fran Katsoudas in Bedfont Lakes, UK, during Cisco Leader Day. You can see what people across the world are saying about the same event, regardless of if you are in your pyjamas at 9 am in Raleigh, North Carolina, or in the Bedfont Lakes in Europe at 2 pm. For the map theme to work best, it’s important that people allow geolocation with their posts so the posts can accurately be displayed on the social map. Since many people have this feature turned off, it’s helpful if you ask your followers to activate location for the duration of your event or hashtag campaign. Where are you embedding Walls.io and were you showing the social wall on location? The link was sent out to participants in an email, and it was displayed in a room in all of our broadcast sites. Participants had access to the wall on their event app, so they could see it on their personal devices as well. We are also looking for a way to embed the wall on our platform that participants watch Cisco Beat on to make it even easier for them to access it. Why did you choose Walls.io for your campaigns? There were many other vendors offering similar things to Walls.io. However, the most relevant things to us were: being able to try before you buy, an option for monthly billing instead of daily, chat support, maximum control over design, and ease of use. Walls.io offered all of this. We will choose Walls.io for our future campaigns for many reasons, especially for their generosity to give us an additional second wall. This wall was used to display the hand-off video in each zone as they started their day. Having the second wall simplified things tremendously. We could have one wall with the map theme that had all of the participants’ posts and a separate one that had all posts hidden except for that hand-off video. Unlike many other social wall apps, Walls.io doesn’t charge exorbitant sums for every day you use your wall. We want people who use social media walls for events to have a chance to prepare and run their walls properly without paying through the nose for every single day. Instead, you can buy event walls per 72 hours and, of course, we always offer a monthly subscription option as well if you need more time. See our pricing models! Overall, how did the campaigns do? Are you happy with the results? We had more than 9,000 page views for our Leader Day wall and we estimate that almost 115,000 people saw #CiscoLeaderDay posts. The Cisco Leader Day wall saw the most traffic on September 27th at 4 pm PDT until September 28th 4 pm PDT. The day of the broadcast, #CiscoBeat mentions on social media increased 107% from the previous month’s Cisco Beat. I’m personally happy with the impressive utilisation of the wall, and the team and I are looking forward to improving that as buzz about the wall continues to grow. Global events aren’t just a challenge because of their sheer scale but because time zones come into play. Cisco’s way to solve that was to hand over the Leader Day event from one time zone to the next in a follow-the-sun approach. Time zones were also considered in the social media approach. The social media team created a separate social wall to use for the hand-off video, making sure each time zone was properly welcomed into the ongoing event. By assigning 16 social media ambassadors across the time zones, the team made sure that every time zone also had someone to specifically make sure people knew about and used the hashtag. The social media wall connected the Cisco leaders in all of the time zones as a common thread, overarching the whole event. Cisco‘s global events show just how big the value is that a social media wall can add to your global event. The important part is to make sure no time zone is at a disadvantage and everyone gets treated with the same respect throughout the event. Putting effort into this was surely a large part of the #CiscoLeaderDay hashtag’s success.